Objective: Micro RNAs (miRNAs) are a class of non-coding regulatory RNAs. We performed a transcriptome-wide analysis of subcutaneous adipose tissue and in vitro studies to identify miRNAs and co-regulated target transcripts associated with insulin sensitivity (SI) and obesity in human. Methods: We selected 20 insulin-resistant (IR, SI=2.0±0.7) and 20 insulin-sensitive (IS, SI=7.2±2.3) subjects from a cohort of 117 metabolically characterized non-diabetic Caucasians for comparison. Results: After global profiling, 3 miRNAs had marginally different expressions between IR and IS subjects. A total of 14 miRNAs were significantly correlated with %fat mass, body mass index (BMI), or SI. The qRT-PCR validated the correlation of miR-148a-3p with BMI (r=-0.70, P=2.73X10-6). MiRNA target filtering analysis identified DNA methyltransferase 1 (DNMT1) as one of the target genes of miR-148a-3p. DNMT1 expression in adipose tissue was positively correlated with BMI (r=0.47, p=8.42X10-7) and was inversely correlated with miR-148a-3p (r=-0.34). Differentiation of SGBS preadipocytes showed up-regulation of miR-148a-3p and down-regulation of DNMT1 in differentiated adipocytes. After transfecting miR-148a-3p mimics into HeLa-S3 cells, DNMT1 was down-regulated, while transfection of adipose stem cells with miR-148a-3p inhibitor up-regulated DNMT1. Conclusions: Our results indicate that miR-148a-3pmediated regulation of DNMT1 expression may play a mechanistic role in obesity. Keywords: Adipose tissue, insulin resistance, obesity, miRNA, transcriptome. Keywords:Adipose tissue, insulin resistance, obesity, miRNA, transcriptome. Abstract:Objective: Micro RNAs (miRNAs) are a class of non-coding regulatory RNAs. We performed a transcriptome-wide analysis of subcutaneous adipose tissue and in vitro studies to identify miRNAs and co-regulated target transcripts associated with insulin sensitivity (SI) and obesity in human. Methods: We selected 20 insulin-resistant (IR, SI=2.0±0.7) and 20 insulin-sensitive (IS, SI=7.2±2.3) subjects from a cohort of 117 metabolically characterized non-diabetic Caucasians for comparison. Results: After global profiling, 3 miRNAs had marginally different expressions between IR and IS subjects. A total of 14 miRNAs were significantly correlated with %fat mass, body mass index (BMI), or SI. The qRT-PCR validated the correlation of miR-148a-3p with BMI (r=-0.70, P=2.73X10-6). MiRNA target filtering analysis identified DNA methyltransferase 1 (DNMT1) as one of the target genes of miR-148a-3p. DNMT1 expression in adipose tissue was positively correlated with BMI (r=0.47, p=8.42X10-7) and was inversely correlated with miR-148a-3p (r=-0.34). Differentiation of SGBS preadipocytes showed up-regulation of miR-148a-3p and down-regulation of DNMT1 in differentiated adipocytes. After transfecting miR-148a-3p mimics into HeLa-S3 cells, DNMT1 was down-regulated, while transfection of adipose stem cells with miR-148a-3p inhibitor up-regulated DNMT1. 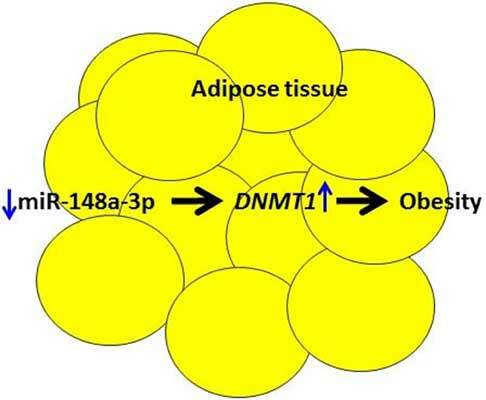 Conclusions: Our results indicate that miR-148a-3pmediated regulation of DNMT1 expression may play a mechanistic role in obesity.